From Baja racing to bashing in your back yard, everyone knows down force helps you put the power to the ground. Now Team Losi helps you put more of that awesome power available in your Losi LST, Losi LST2, and Losi Aftershock to the ground with their new LST rear wing kit. The Losi wing kit (LOSB8050) includes simple bolt-on struts engineered to be sturdy yet light, all hardware, and a tough injection molded wing. The wing is nothing short of a work of aerodynamic art. The multi-element design produces high down force with a minimum of drag, much like an Indy or Formula One car. The added performance is remarkable but the look is sensational. The addition of the rearward sloping wing protruding up from the back of the bed makes the Losi LST and Losi LST2 look like itâ€™s ready to fly. 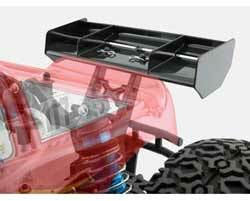 Visit our Team Losi LST Talk forum to discuss the new LST wing kit!